British magician Dynamo seemingly levitated next to a red double-decker, steadying himself with one palm on the top of the bus. The stunt was to announce his partnership with Pepsi MAX, kickstarting the brand’s ‘live for now’ campaign. Standing at the bus’ side with his feet dangling in mid-air, he left from Millbank before the number 543 bus (this Guardian piece tells us there isn’t a number 543 in service) passed London landmarks such as Big Ben and the Houses of Parliament. Jonathan Creek would have already worked out how it was done, but us mere mortals should all just sit back and appreciate what is a very nice visual stunt. Blu-tac. A metric ton of blu tac. Wow, this really shows how good magicians in London can be. 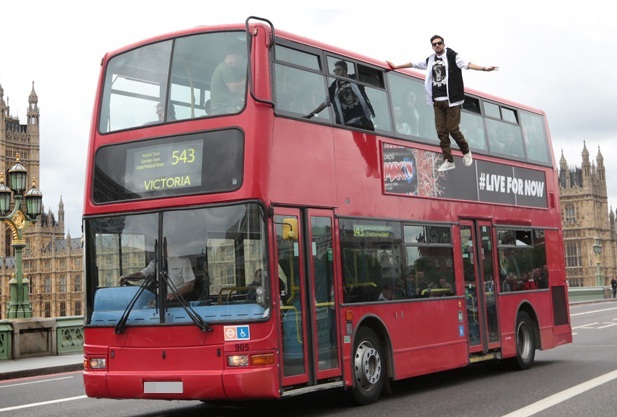 As a Lond Magician I appreciate that he’s doing this with a London bus. It’s great to see another magician in London perform a great stunt. Nottingham, its great to see Dynamo keeping magic cool and popular!! I saw Dynamo perform his magic show in Sheffield a few months back and his magic like this stunt was amazing! !